Michigan lawmakers recently began to consider a proposal to significantly reduce the use of data in educator feedback. The proposal, House Bill 5707 (Miller, R), would relegate student improvement data from the state to as little as 12.5 percent of an educator’s evaluation. As a result, nearly 90 percent of educator evaluations would come from other sources. 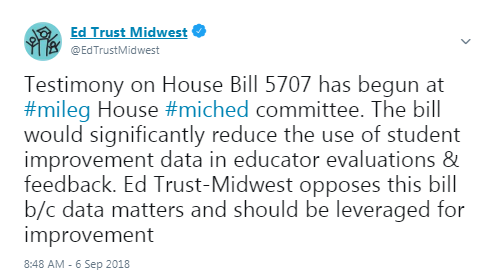 Although Michigan’s framework for providing honest, trustworthy and actionable feedback to educators should be improved, The Education Trust-Midwest opposes House Bill 5707 as it would amplify flaws in current law and do nothing to improve the quality of teaching and learning in Michigan classrooms. The Data Quality Campaign recently released the results of significant parent and teacher polling on attitudes towards education data. They found that parents and teachers agree on the power of data in the classroom. Despite this, teachers face barriers to using data, including a lack of time and training to put it to work for students. And they found that parents and teachers find data useful for making decisions and supporting students. There are no committee meetings scheduled this week, as the Michigan Legislature is adjourned until September 25, 2018.